Dodo is just another name for fried (ripe) plantain. Lovely on it's own, even better with something else on the side to make a complete meal. To make the bean chilli, place the chopped tomatoes in a large saucepan and simmer with a 1/4 cup of water for 5 mins. Add the chopped vegetables (peppers, onion, carrot). Simmer for a further 10 mins until the vegetables are soft (but not mushy!) and most of the water has evaporated. Stir in the cooked beans, chilli powder and season to taste. To make the dodo, peel the plantain and cut into medium-thin diagonal slices. 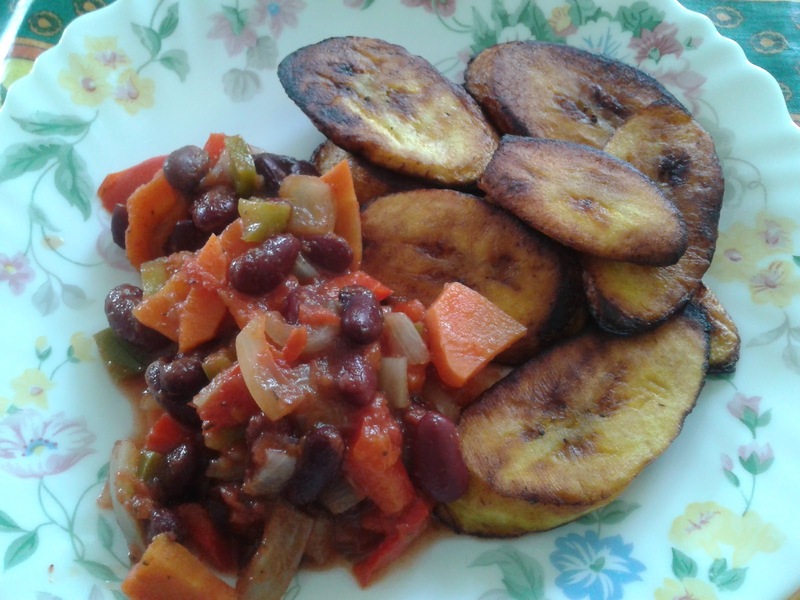 Heat the oil in a frying pan and fry the plantain slices. Be careful not to overcrowd the pan. Cook until golden brown underneath then turn over to brown on the other side. When done, drain on some kitchen paper to get rid of excess oil. Plate up the dodo and serve with your scrumptious bean chilli.